Alatai Holiday Apartments Darwin has studio & 2 bedroom self-contained units providing accommodation in the heart of the Darwin CBD. The apartments are built in a courtyard setting, combining an oriental and tropical theme. The features include a swimming pool and barbecue surrounded by palms, tropical flowers and sweet smelling shrubs. The Alatai Holiday Apartments are ideally located close to all city facilities. Just a few minutes downhill will take you to the beach, Botanic Gardens, Mindil Beach night markets, casino and golf course. A short stroll will take you to the general post office, city mall, shopping centre, cinema, city attractions, nightspots or to Port Darwin. Many of Darwin's other exotic attractions are just a short trip away by bus, taxi or as part of one of the many organised tours that are available daily. Enjoy traditional Chinese cuisine at Darwin's famous Dragon Palace licensed restaurant open 6 nights a week, or enjoy the Garden Cafe for Continental breakfast . The Palms City Resort is conveniently positioned on the picturesque Esplanade in the heart of the Darwin CBD and offers the very best in corporate and leisure accomodation. The Palms City Resort is a unique resort offering boutique style accommodation in a range of motel rooms and free-standing apartment villas surrounded by beautiful tropical gardens. The low-rise development with its fresh, vibrant furnishings, the use of natural woods, local artwork and use of cedar wood and glass louvre windows, provides an ambience that just can not be found in the usual, high-rise, mid-city hotels. The beautifully landscaped gardens at the Palms City Resort that have created a tropical paradise in the heart of the cityand have been carefully planned and maintained with vivid coloure to create cool shade throughout the resort. The hotel resort is located in the heart of Darwin CBD, overlooking the Darwin Harbour and parkland foreshores. It is in close proximity to the Centataph and Parliament House and a short, one block stroll from the vibrant Mitchell Street with it's plethora of restaurants, pubs, nightclubs, night markets, theatres and entertainment centre as well as being just seconds away from the Smith Street shopping district. Moments down the road is the Deckchair Theatre, an open-air cinema where movies screen every night of the dry season. Guests staying at the Palms City Resort can relax on their own verandah, fire up the BBQ and sip on a cool drink, as the sun sets over Darwin Harbour. Guest facilities include free on site car parking, magnificent landscaped, free-form swimming pool, spa, BBQ facilities, guest laundry, tour information, 24 hour reception, conference facilities, wireless internet access throughout the resort, business services, secretarial services, dry cleaning service, vending machines, luggage storage and safekeeping facilities. Quest Darwin is one of Darwin's newest serviced apartment accommodation providers, offering 4.5 star studios, 1 & 2 bedroom self contained apartments. Quest Darwin was the proud winner of the 2006 & 2007 Brolga Northern Territory Tourism Awards for Deluxe Accommodation. Quest Darwin is ideally located in the heart of Darwin's cultural centre, shopping and restaurant precinct, reflecting a variety of international cuisines. The superbly appointed serviced apartments will ensure your Darwin experience is a stylish and comfortable one. All one and two bedroom apartments feature separate living & dining areas, a fully equipped kitchen including microwave, dishwasher, oven and hotplates, private laundry facilities with washing machine and dryer as well as a balcony. The studio rooms feature comfortable bedding, a kitchenette and an ensuite bathroom. For your convenience, all guest accommodation rooms are serviced daily, providing the comfort of apartment controlled air-conditioning, DVD player, iron and ironing board, ceiling fans, colour TV, FREE Austar TV, direct dial phone with voice mail, separate dial-up connection points & dedicated telephone lines for fax/modem, a work desk with lamp and high speed wireless broadband access. In addition to the spacious apartment style accommodation, Quest Darwin also boasts FREE undercover parking, on-site meeting / conference facilities, valet laundry service , dry-cleaning service, restaurant chargeback , breakfast packs, pantry shopping service, secretarial service, baby sitting, tour desk, key card security system to all areas plus an alfresco barbeque area and an inground swimming pool. Quest Darwin is located centrally in the Darwin CBD. Restaurants and shopping facilities are within easy walking distance and a Woolworths store is located next door. The Darwin International Airport is located 12 kilometers from Quest Darwin. Litchfield National Park, just 2 hours drive from Darwin, is a must see. Mindil Beach sunset Market, located just 2km from Quest Darwin, features 60 food stalls representing all points of the globe with numerous food and craft stalls and various live performances. The picturesque coast line and many other attractions are all within close proximity.Complete with Quest's renowned personalised service, Quest Darwin Accommodation is the ideal base for business and leisure and very much looks forward to welcoming you. The Quest Parap Serviced Apartments has a wide range of modern and well appointed studio, 1, 2 & 3 bedroom self contained serviced apartments in Parap, which is ideally positioned just 5 kilometres from the Darwin CBD. Bringing stylish and luxury accommodation to Parap the Quest Parap Apartments are ideal for corporate and leisure travellers alike. In the heart of Parap Village, Quest Parap is conveniently located a five minute drive from the Darwin CBD and only a 5 minute walk from the colourful markets held every Saturday. With some funky shops and cafes in its midst, Parap is a classy little shopping village, close to public transport and sporting facilities including the Darwin Turf Club. The Quest Parap Darwin Serviced Apartments offer a selection of brand new apartments that are all spacious, modern and well appointed with smart furnishings and decor. The Quest Parap Darwin Serviced Apartments also offer a range of facilities and services to make your stay an enjoyable one. Recreation facilities include an outdoor swimming pool, BBQ facilities, entertaining area, on-site car parking, wheel chair accessibility, restaurant chargeback, 24 hour on-site management, pantry shopping service, breakfast packs, valet dry cleaning, tour assistance, baby sitting service, daily housekeeping, lift, luggage storage and cot hire. The Quest Parap Apartments also cater for corporate business travellers with wireless internet access in all apartments, business administration services, secretarial services, faxing facilities, photocopying services and excellent conference meeting facilities. Boasting a beautiful and unique location in Australia's Top End the Mantra on the Esplanade Apartments Darwin provides travellers with luxury hotel accommodation as well as 1, 2 and 3 bedroom self contained serviced apartments. The property is conveniently situated in an unrivalled location overlooking Darwin Harbour and the Arafura Sea in the Darwin CBD, making it perfect for both corporate and leisure travellers. The Mantra on the Esplanade Darwin Hotel & Apartments in within close proximity to the beautiful waterfront and has panoramic views across the Darwin Harbour, out to the Arafura Sea and presents the ideal vantage point from which to experience a famous Northern Territory sunset. The Mantra on the Esplanade's hotel and apartment accommodation are all designed to reflect Darwin's tropical style and all boast stunning views of the Darwin City Skyline or the magnificent harbour. All guest accommodation rooms and apartments are modern, spacious, non smoking and comfortable, featuring luxurious and contemporary decor yet designed to reflect the local tropical style and comfortably casual laid-back ambience. All hotel rooms and apartments have recently been refurbished with modern furnishings and contemporary decor and offer climate controlled reverse cycle air conditioning, key-card room access, comfortable bedding, modern private ensuite bathrooms and everything that you will need to feel right at home. At Mantra on the Esplanade Darwin Hotel & Apartments you will find an outdoor swimming pool, spa, onsite beauty salon, 24 hour reception, restaurant and bar, concierge, dry cleaning service, tour desk, airport transfers, child minding service, safety deposit boxes, lift, luggage storage, cot hire and daily housekeeping. Darwin Deluxe Apartments provides travellers to the Northern Territory with a wide range of quality three bedroom two bathroom luxury self contained apartments that are perfectly poitioned along the beautiful Darwin Esplanade right on the waters edge. This charming Darwin accommodation provides the perfect escape for you and your family or partner, where you can enjoy tranquil accommodation while still being close to the hustle and bustle of the city. Darwin is well catered for in terms of leisure activities and entertainment options. There are the beaches, the harbour, a lively nightlife scene, a wide choice of dining options, theatre at the Darwin Entertainment Centre in Mitchell Street as well as Deckchair Cinema. Most sports are catered for & many facilities are world class. At Darwin Deluxe Apartments, each luxury apartment is in an elevated location, featuring Harbour and City Views. All are within a short walk to the Darwin City Mall, Darwin CBD and Darwin city attractions and are conveniently located just five minutes walk to restaurants, cafes and fashion outlets. They are within walikng distance to the nightlife hub of Mitchell Street, the Darwin Entertainment Centre, attractions including the Fish Feeding, Crocosaurus, Wharf Precinct and the Darwin Convention Centre & Wave Pool. The apartments are also just a short drive to the Famous Sunset Mindil Beach Markets, The Skycity Casino and the Darwin Museum and Art Gallery. The Darwin Deluxe Apartments offer a range of facilities and services for guest convenience, including free undercover car parking, outdoor swimming pool, BBQ facilities and entertainment area, gym and fitness centre, landscaped gardens, secure lift access, free cot hire, tour desk, luggage storage, faxing facilities and airport shuttle can be arranged at reception. The accommodation provided by the Argus Apartments in Darwin comes in the form of luxuriously appointed 1, 2, 3 & 4 bedroom self contained serviced apartments and penthouses with waterviews in the heart of the Darwin CBD. Why squeeze into a hotel room, when you can relax in a fully self-contained apartment and enjoy the luxury of space. The Argus Apartments Darwin are ideally located in the heart of the Darwin CBD, with a great selection of great fashion retail shops, gourmet restaurants and cafes within easy walking distance. Argus Apartments Darwin are also centrally located to the beaches, nature parks, art galleries, water sports, Darwin Casino and vibrant nightlife. Day tours to Kakadu, Katherine Gorge, Litchfield National Park pick guests up at from reception. Perfect for a couple's romantic getaway, corporate travellers or a fun-filled family holiday, Argus Apartments Darwin offer a choice of luxury 1, 2, 3 & 4 bedroom self contained serviced apartments and penthouses. The apartments are extremely spacious, ranging in size from 240m through to 580m for the spectacular Double Storey 4 Bedroom Penthouses. All apartments and penthouses are brand new, modern, comfortable and non smoking, luxuriously appointed with contemporary decor, furnishings, amenities and facilities designed to provide guests glamorous accommodation style in the Darwin CBD. Argus Apartments Darwin features hotel style facilities including a gym, an undercover pool, 24 hour reception, BBQ facilities and entertaining area, onsite secure undercover car parking, lift, luggage storage, newspapers, disabled facilities, safety deposit boxes, tour desk, free baby cot hire and broadband internet connection in all apartments and penthouses. The Kingston Village Executive Apartments Darwin is conveniently located in the popular, upmarket Darwin suburb of Parap and provides beautifully furnished 2 bedroom self contained serviced apartments for business and leisure guests. The suburb of Parap is known for its boutique style shopping village and famous food and art craft market held every Saturday. Conveniently located only minutes drive from the Darwin CBD, The Kingston Village Executive Apartments Darwin are within a 5 minute drive from the George Brown Darwin Botanic Gardens, 10 minutes drive from the Darwin Convention Centre and 14 minutes drive from the Darwin Golf Course. 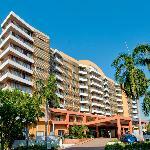 The Kingston Village Executive Apartments Darwin are comfortable, relaxing and stress free. At the Kingston Village Executive Apartments Darwin you will have a tourism display in the apartment which boasts the popular tourist destinations and dining spots locally and around the Northern Territory. The Kingston Village Executive Apartments Darwin offer modern and secure 2 bedroom 2 bathroom serviced apartments that are less then 2 years old, and all apartments are fully furnished and fully equipped with all the essentials to suit leisure or business travellers for either a short or long term stay in Darwin. Guests can relax by the large resort swimming pool, surrounded by tranquil tropical settings and further guest facilities and services include a lift, 2 free secure under cover car parking spaces, security and free hire of cots & high chairs. Coconut Grove Holiday Apartments are high quality, affordable accommodation located in a lush tropical setting in Darwin. All of the Coconut Grove Holiday Apartments have full kitchen facilities and are serviced weekly. Situated close to Darwin Airport the Coconut Grove Holiday Apartments is the perfect accommodation base from which to explore Northern Territory's tropical Top End.There are one, two and three bedroom serviced apartments at Coconut Grove and all of the apartments come complete withh all of the conveniences of home and are ideal for both short and long-term accommodation.